Front row - Pte B Vickers, Pte "Kitty Boustead", Sec Lt R R Hayes, Sgt G Blamire - Pte`s D T Rigg and Walker were unavoidably absent. Above is a picture of keswick lads who are on the Somme front, all in the 7th battalion Border Regiment of Lieut R. R. Hayes, son of Mr T. R. Hayes, chairman of keswick Urban Council. 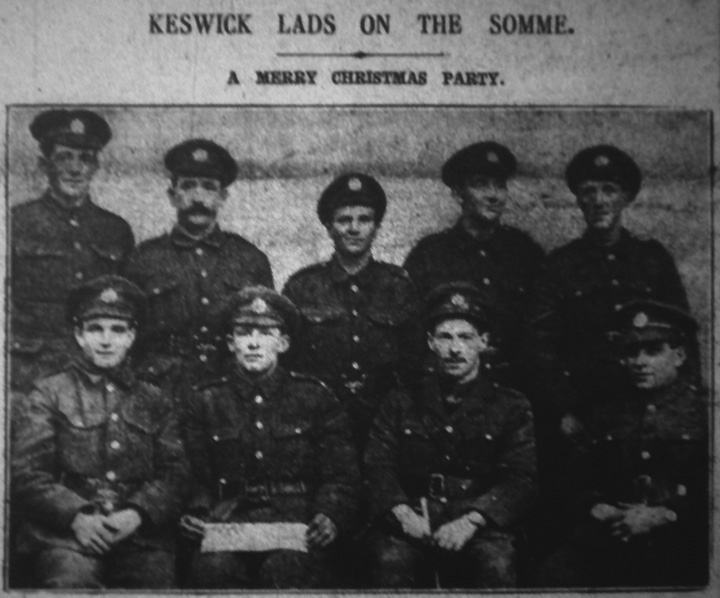 On the 20th of December Lieut Hayes hunted up his Keswick comrades before going into the trenches and entertained them to a " Keswick night " of their own. The supper which consisted of steak and chips, cauliflower with sauce, sardines on toast, custard and fruit, cigarettes, etc - not bad even for a Christmas party at home - was thoroughly enjoyed. One of the lads Pte Bousfield son of the Keswick council foreman , was so pleased he broke forth into song in praise of the event. Lieut Hayes in a letter home, speaks very highly of these sons of keswick, and especially their work in the trenches. Sgt Blamire he says is extra good and the company commander places great confidence in him. Lance Corpl Rigg is great on the Lewis gun, and carries the heavy gun up the trenches with never a complaint about its weight, and he will readily take a extra turn of duty on the gun if there is a likelihood of catching the Boche on the hop. Pte Stoddart is the champion shot in the Btn and is specially selected for work in the sniper`s section. He won the brigade shooting competition not long ago. Pte L Boustead helps L-Cpl Rigg work the Lewis gun and carries most of the ammunition. His brother " Kitty " is one of the pluckiest fellows I`ve ever met, and however fagged out he may be he will cheer up the fellows round him with a joke, and he is a real son of his father in the poetry line. Pte Robinson s a good signaller and a fine chap. Pte Vickers is a great lad and although smallest of the lot is not lacking in pluck. He is a good cross country runner, and will carry his heavy pack and never give in or fall out on the march. Pte Morgan is not with the Btn as he has been specially selected for work on the trench mortar gun. Pte D T Rigg is a fine lad , and keeps any party alive with jokes and fun. Pte Walker is a good chap and is on special work making roadways near the trenches.